Tuesday 1 February Origins & Development of the Safety Pin Dr. John Alexander. We welcome a return visit by Dr. Alexander of the Department of Archaeology, University of Cambridge. His last lecture to us, in January 1981 was on his excavations at Qasr Ibrim. Back in November 1955 he lectured on World Archaeology. This time the intriguing title alone will, we are sure, bring members flocking in. Volume 48 (1982) of The Proceedings of The Prehistoric Society carries a long article by Dr. Alexander on the same subject, beginning on P.40: Those who like to come well-prepared are recommended to read it. By the way, we understand that some members found themselves locked out of the Library - and the January lecture - at 8:10:p.m. If it happens to you, please BANG until someone comes. We are trying to solve one or two Library problems at the moment. Tuesday 1 March Egypt, Gift of the Nile Vivienne Constantinides. Miss Constantinides is the daughter of our Society's Founder. Early Mining & Metallurgy from its inception to the Bronze Age. Dr. Paul Craddock. Wednesday 18 May Annual General Meeting. The Library has made a double booking and we have had to alter the date of this meeting. Please mark your programme card and diary accordingly. The New End Theatre is no longer dark. A new Revue,"War to War", dealing with the Twenties and Thirties, should interest our members. It runs from January 25th to February 26th, starting at 8.p.m and groups of 11, or more ,H.A.D.A.S, members are offered concessionary prices - £2.50 or £3.00. BOX OFFICE MANAGER 435 6053/4. WATERY NOTES - continued, by Sheila Woodward. The third and fourth walks in the series designed to explore the watercourses of the Borough of Barnet took place on 27th December and 16th January. We completed walking the Silk Stream to the confluence of Deans Brook and Edgware Brook and found that this stretch of the stream is heavily constricted, 'sometimes inaccessible, and sometimes completely underground. We then followed Deans Brook Northwards from Deansbrook Road, along its meanders between steep and for the most part natural banks. It provides a classic illustration of the characteristics of such a stream with the bank on each outer curve heavily undercut and deposition on each inner curve creating small gravel beaches. Flint pebbles abound but so far no worked stone has been found. Subsequently the brook enters a hundred yard long culvert which carries it un the old railway line and the Northern Line, just South-East of Edgware Station. Walking, or rather wading, through the culvert proved an interesting if slightly eerie experience. The water was deep and the roof was low, so a stooped posture and shambling gait reminiscent of Primitive Man/Woman had to be adopted. The dimness of the light and profusion of cobwebs tended to impede Archaeological observation. The bone we found did not belong to a Sabre Toothed Tigre, and the cry that there was a hand floating in the water proved to be a false alarm. We ended our walk at Brook Avenue. The investigation will continue on 30th January and 10th February. For details of meeting points, please phone Mrs. Brigid Grafton Green, 455 9040. Rescue Archaeology Service for Outer London Boroughs. There has been under consideration for some time a proposal for the GLC to set up a professional rescue Archaeology service for the Outer London Boroughs, similar to the one which operates in inner London. Discussions started some years ago between LAMAS, GLC and the Museum of London; about a year ago proposals (later revised) were put before the Councils of the Boroughs which would be concerned. The initial reaction of the London Borough of Barnet was that such a service was unnecessary in our area; however, if a service should be instituted, LBB would be required to contribute to it under precept arrangements. The Committee has now heard from Mr. Bennett, Chief Executive and Town Clerk of LBB, that if the service comes into being, Barnet will take advantage of it as necessary. Mr. Bennett has told GLC that LBB's involvement "will be on the basis of a close liaison with the Hendon and District Archaeological Society." Mr. Bennett also tells us that "the Council attaches great importance to the close working relationship with HADAS and other local voluntary bodies." HADAS Lectures. Two Committee members will be lecturing in April, to very different audiences. At the LAMAS Conference of London Archaeologists at the Museum of London on Saturday April 16th Ted Sammes will speak on the Church Terrace excavations of 1973-4. We've heard that just es we go to press, so more about it in subsequent Newsletters. On Thursday April 21st, Sheila Woodward has been asked to talk about Archaeology in North-west London, from the viewpoint of a local society. This occasion is the Ladies Evening of the Institute of Mechanical Engineers, Greater London Branch N.W. Panel. The talk will be at the Harrow College of Further Education, Northwick Park, Harrow, at 6:30 for 7:00.p.m. Chairmen of the Branch (another HADAS member) Alfred Gower, asks us to say that any Society members who care to attend will be most welcome. The Publication of Archaeological Excavations. A public meeting to discuss this a vital topic in times when publishing costs soar and storage space for finds dwindles - is to take place in London on March 8th next. To open the discussion there will be a paper from the British Museum on the subject, and another from a joint working party of the Council for British Archaeology and the Department of Environment. 15 day Archaeological Tour of Israel. We have received notice of a very interesting 15 day Archaeological Tour of Israel from the 2nd to the 16th of October, 1983, accompanied by Roberta Harris, Lecturer in Biblical Archaeology for many years at the City Literary Institute. The Itinerary is most impressive and the cost £578. Further details from Project Expeditions Ltd. 36, Great Russell Street. WCl B3PP.Te1:636-1262. Here are some more sites for which planning application has been made. Some, perhaps all, of them might be of Archaeological interest if permission to develop is given. Should you happen to live near any of them, and should you notice any kind of building activity,' please let Elizabeth Sanderson know on 950-3106. Land adjoining 83 Milespit Hill. Land rear of 136, Audley Road/92, Vivian Ave. Land rear of Birchglade, fronting Oaklands Lane Arkley. Building adj. 1, Wellhouse Lane,Barnet. REPORT ON THE JANUARY LECTURE. by Nell Penny. Call it the Manor of Tyburn - the parish of St. Mary-le-bone - Regent's Park: Dr. Ann Saunders knows all about it, and has shared her knowledge with HADAS members in two friendly and lively but scholarly lectures. The first one, given at extremely short notice, took us from a hamlet on what was to become the Oxford road, to Henry VIII's creation of a hunting park in the forest North of a later village. Dr. Saunders would like to think the irregular circle of Marylebone Park was the King's own 'doodling' on an empty map. This month's lecture, by the 'chalk and talk' method, began with the Tudor deer park. Edward VI's treasury paid for a fence on top of the perimeter mound, Elizabeth paid for a wooden standing from which she might shoot deer and she entertained her patient suitor, the Duc d'Anjou in the Park in 1582. The early - Stuarts preserved the hunting park, but hard pressed Charles I had to pawn it to two Royalists, Sir George Strode and John Wandesford in return for "Musquettes, Match and Pikes". In 1650, after the execution of the King, the Commonwealth Government was as poor as he had been, and was willing to sell royal estates for cash. Marylebone Park covered 500 acres; there were 124 deer and over 16,000 trees largely oak, ash and elm. Elizabeth's bakenstand was at £3.6s. 8d. Three New Model Army Officers bought it for £13,000 and set to work to recover their money as quickly as they could. The trees were felled and sold (many were ear­marked for the Navy) and the land let out in small holdings. So the royal hunting park boundaries were ploughed out and the land was farmed mainly as meadow. At the Restoration the Park reverted to the Crown but it remained farm land until the inception in 1809 of Nash's grand plan of a residential estate and public park connected to London by magnificent new roads. There were three farms: Marylebone Park Farm, White House Farm and Coney burrow Farm in the East. They grew hay for the thousands of horses in the capital and had dairy cows to supply milk to the human inhabitants. We hope that Dr. Saunders is willing, sometime soon, to tell us about the realization of Nash's designs and the subsequent development of the Regent's.Park. Our Chairman, Mr. Brian Jarman, who had welcomed us to the first meeting of 1983, thanked Dr. Saunders for her thoroughly enjoyable lecture. One of the prayers offered by the Minister during the service gave thanks by name or all those who had had a part in the day's ceremony, from Benjamin Waugh himself downwards. You will, I am sure, be glad to know that HADAS was not forgotten, but was commended to God for its initiative and research! Tailpiece: many thanks to Ella and Eric Ward for filling one of the gaps in our information about Benjamin Waugh. In last month's Newsletter we listed the other commemorative plaques which have been erected to him; and we mentioned that we thought there was one in Southgate. Mrs. Ward remembered taking her children to see it in years gone by; she provided the Newsletter with the information that it is on Barclays Bank, 33, The Green, Southgate, in the Borough of Enfield; that it is square in shape and that it carries, among other things, the quotation "the only cry he heard was the cry of the child." She also sent us an admirable little map to show how to get there. That plaque was erected in 1934. NEWS FROM THE DOCUMENTARY GROUP. In the December Newsletter the group was seeking volunteers for research into the use of flint as a building material in the Borough. We are happy to report that the Wibberleys - Brian, Rosemary and the children —have offered to undertake this as a family project; so we look forward to further reports from them from time to time in the Newsletter. Meantime, any member who notices a flint building in the. Borough (either a public building or a private house) is asked to let the Wibberleys know, on 440-7606. Some research into an area of land near High Barnet Station, which is being undertaken by Alec Gouldsmith, has produced one interesting query. Where do the two streets, Potters Land and Potters Road, near the foot of Barnet Hill and to .the east of the main road, get their name? Is it associated with an ancient pottery? Any information on the derivation will be gratefully received by Brigid Grafton Green (455-9040). In course of research some time ago Percy Reboul found a set of old glass lantern slides, 3" x 3", of Mill Hill and Hendon about the turn of the century. They are particularly interesting in showing old roads, buildings, bridges, farms now demolished and so on. Percy reports that, with the owner's permission, LBB Local History Collection has been able to re-photograph the slides so that they can be made available for general research. A number of new members have joined the Society in recent months. E.G. Brassington, N.W.5; Mrs. Collingwood, N.Finchley; Mr. & Mrs. Court, Hendon; Melanie Kent, W. Hendon; Linda Langenfeld, Maida Vale; Miss A.M. Large, Finchley; Mr. & Mrs, Leeb, Finchley; Diana Mansell, Garden Suburb; Mary McGhee,Edgware; Andrew Pinto, Mill Hill; Edward Sewell, Colindale; Pat Tyler, Garden Suburb;_ Mary Wood, Canterbury. And talking of members, you will find a new membership list, complete to January 1st, 1983, enclosed with this Newsletter. Preparing it is one of the trickiest jobs our membership Secretary, Phyllis Fletcher, has to face. Eight pages of addresses and (worst of all) phone numbers is a nightmare to type correctly. If, despite checking and double checking, a mistake has crept in somewhere, Phyllis asks you to let her know as soon as possible - so will you look at your entry right now? Many members, we feel sure, already subscribe to that excellent magazine, Current Archaeology, whose co-editor, Andrew Selkirk, lives in Hampstead and has been a HADAS member for the last 6 years (the other co-editor is Andrew's wife, Andy). For those who are not familiar with it, Current Archaeology is published six times a year (which doesn't necessarily mean at regular 2-monthly intervals) at a subscription of £5, which includes postage. "Current Archaeology is of prime importance in making up-to-date information on excavation and theory available in an attractive format both to professionals and a wider public.It's most important function is the spreading of news about current work and its implications outside the increasingly narrow compartments into which specialist archaeology is being divided." You can take out a subscription to Current Archaeology by writing to Andrew Selkirk at 9, Nassington Road, N.W,.3; and just now, to celebrate its 15th birthday, there is a special offer: you can get the last 6 issues for £4 instead of as well as taking out your new subscription. INDUSTRIAL ARCHAEOLOGY AT SCRATCH WOOD AND ARKLEY. by Bill Firth. A Planning Application for an extension to Arkley Mill prompted an investigation on the ground and provided an opportunity to look at some other sites in the vacinity. Hero was a good case for a day out on I.A. competition by adding interest to the journey. On the top of the Tunnel there is evidence of at least one earlier fence and the remains of some iron palings of typical Midland Railway type but nothing to confirm this. Back on Barnet Way I reflected that this itself is I.A..It was built as a three lane arterial road in 1920-24 by the Ministry of Transport as part of an unemployment relief programme as the new motor route from London to th North on a line recommended by the London Arterial Road Conferences of 1912-16. A bit further North between Barnet Lane (TQ 208 953) and Ripon Way (TQ 210 958) there is almost the only stretch of Ribbon Factory development along, the considerable length of arterial roads in the Borough. It seems that Middlesex County Council took powers to control such development earlier than the 1935 Restriction of Ribbon Development Act and, in fact, the development at Borehamwood was one of the few attempts to integrate housing and industrial development around a new motor road. John Laing acquired 470 acres for a "Garden City Estate" for houses and factories separated from the main road by a service road. The scheme was never completed because of the Second World war. Six factories were built of which three are still immediately obvious from their 1930's style - at Stirling Corner (now Thann Synchronome) at the corner of Ripon Way (now Carl Zeiss) and, most obviously, the Kalle factory with a typical 1930's circular tower over the entrance. So, East up Barnet Lane. to turn left into Brickfield Lane. The reprint of the 1 inch O.S. First Edition shows kilns along the North Side of Barnet Lane but no brickfield. Later maps show evidence of a pit filled with water. The 6" O.S., of 1873 shows an extensive brick and tile works on the South side of Barnet Lane. There is now no real visible evidence of a brickfield off the lane. The area is part of the grounds of Arkely Mill and has been landscaped but it is tempting to assume that the ornamental lake was once a clay pit. The other side of Barnet Lane is covered in Modern property and no evidence of a works remains. One can go round the back of the windmill by the footpath from Brickfield Lane to Rowley Lane and can get glimpses of it. It can also be glimpsed behind the house from Windmill Lane. (It is the house that is being extended). It is evident that there is no hope of sitewatching but in any case it has been so landscaped that most of it must be made ground and not very revealing. On the East side of Rowley Lane there is a reservoir (not marked on earlier maps) and in the 'V' where the lane is joined by Rowley Green Road there is a modern concrete water tower(TQ 219 957). At the Rowley Green Road entrance there is a modern notice (Lea Valley water Co. Arkley Tower and Reservoir". The evidence is that the reservoir is as modern as the tower. At the same junction there is a signpost. The post is obviously not old but the arms are. The length of Rowley Green Road is lit by old gas lamps converted to electricity. On the left hand side of the road there is an older reservoir (TQ 221 958). In the almost rural nothern marches of the Borough I had found much of I.A., interest and a number of things to follow up. It had been a good day out. Are any HADAS members junk-shop addicts - or would it be more sensible to ask "Are there any who aren't?" If you are one of those who find it herd to pass any shop selling bye-gones, we have a little job for you. Will you very kindly keep your eyes skinned in future for a camera obscure? In case you're not quite sure what that is, it's a drawing aid: a piece of apparatus which makes it possible to project from a distance onto drawing or graph paper the excate outline (and also some of the detail) of, say, a worked flint. 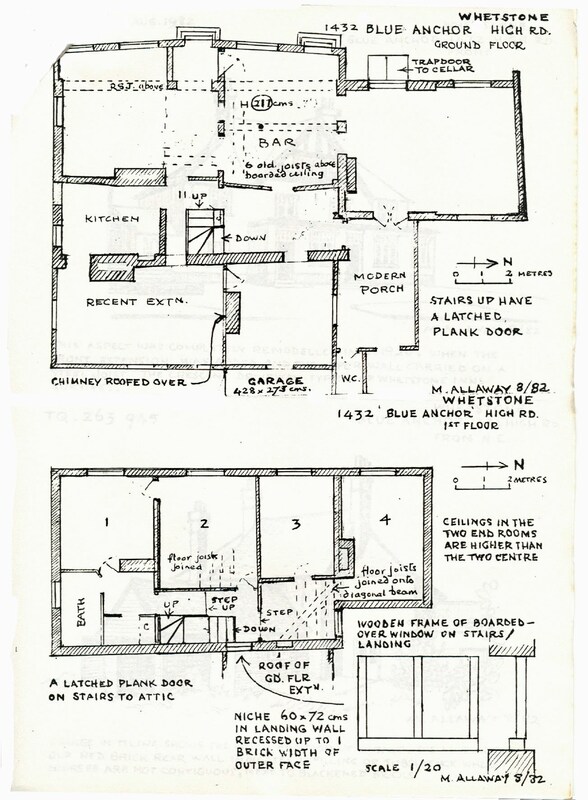 Then even e ham-handed draughtsman can draw around the outline and can indicate the detail. The apparatus is still used in museums - for example, at the Natural History Museum in South Kensington for drawing moths and butterflies - but it is otherwise out of fashion. Daphne Lorimer has been trying to find such a piece of equipment for HADAS's use, and has been told that it is no longer made. However, it is suggested that a second-hand one can sometimes be picked up in an antique or junk-shop. £60 would be a fair price for it: anything above that would be too much. but some camera obscure have been found at real knock-down bargain prices like £1.50p. What does it look like? Well, Daphne describes it as a narrow wooden box, perhaps 21" or so long, with inside it a series of prisms. Should you ever see one, please let her know - especially if it's nearer the £1.50. end of the scale. DEMISE OF THE BLUE ANCHOR. 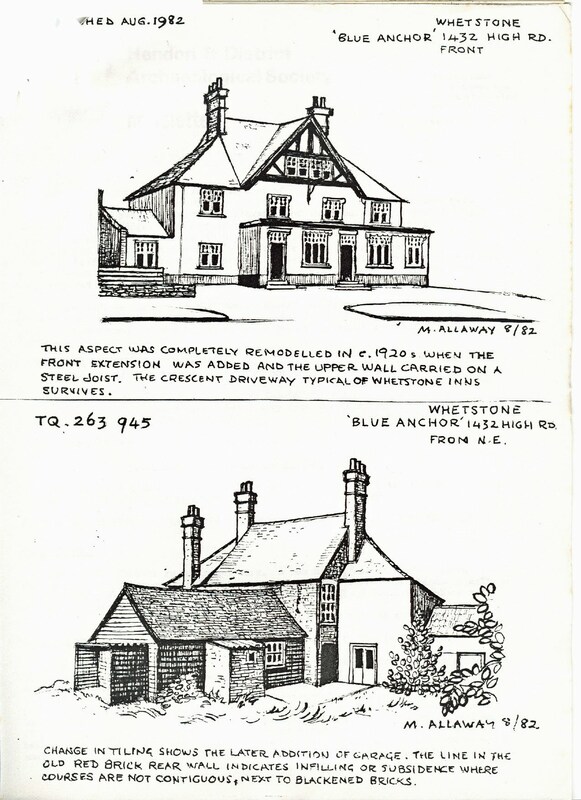 The final three pages of this Newsletter are devoted to the record of an interesting local building - the Blue Anchor -pub at Whetstone. This was demolished last summer. 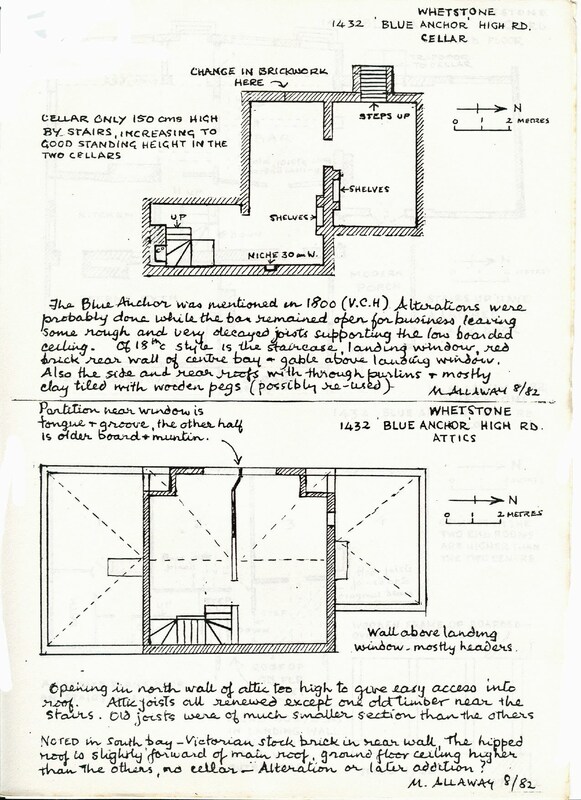 Before the pub was knocked down HADAS members Mary Allaway and Percy Reboul did some documentary research into its history; and they spent the best part of the Sunday before demolition began studying,measuring and recording features. This-was rather an eerie experience, as the building had been closed for some weeks, part of it was boarded up and the electricity had been cut off. Mary Allaway's drawings show you the results. There are also photographs to complement the drawings: some taken by Percy Reboul, and others by the Local History Collection of LBB. The site has now been levelled and when redevelopment begins, HADAS hopes to watch any service or foundation trenches that may be cut across it. The Agents are very co-operative, and tell us that no activity is likely to start until March at least.